If you need a new washer and dryer and don't have the cash or the credit to buy them, you might choose to try rent-to-own. But you might pay nearly quadruple for the set than the typical retail price. (RNN) – If you need a new washer and dryer and don’t have the cash or the credit to buy them, you might choose to try rent-to-own. But you might pay nearly quadruple for the set than the typical retail price. And if you fall behind in a payment by as little as a day, you could face unending calls, unwelcome visits to your house and even threats of jail. Even consumers with no ties to the rental merchandise face debt-collection harassment when a friend, relative or coworker misses a payment. If these products had been purchased with credit, where laws require disclosures and debt-collection protections, these customers could find help. But there’s little that state and federal regulators can do to help customers who leased household goods from Rent-A-Center, the country’s leading rent-to-own company with nearly 2,500 stores across the U.S.
Lawsuits, complaints and customers’ records show that Rent-A-Center’s lease agreements and the lax government regulation of the rent-to-own industry leave consumers vulnerable in these transactions, according to a joint investigation by Raycom Media and NerdWallet. Customers face high prices and exorbitant fees. They sometimes struggle to get an accurate payment history from the company. They are harassed and threatened with arrest when payments are overdue. The contract terms cripple some customers when they became sick or lost their jobs. 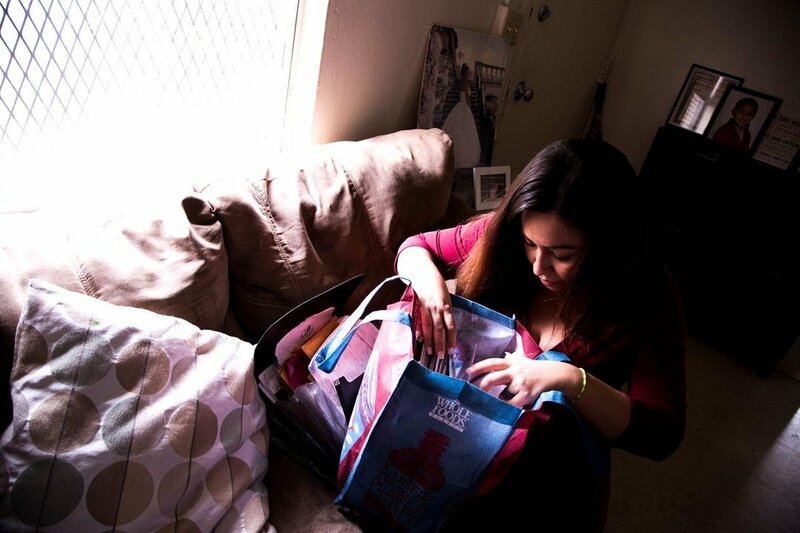 It all happened to Jessica Gonzalez, a single mother from Miami, Florida. She was so fearful of the company employee who arrived at her house to talk to her about her missed payments that she and her young sons sought refuge in a hall closet. For more than an hour last summer, the family hid while the employee outside her duplex went from window to window banging and yelling for Gonzalez to open the front door. She didn’t even consider calling the police; she feared they’d arrest her. “The embarrassment we went through, it seemed like stalking,” Gonzalez said. Rent-A-Center and other rent-to-own companies do not answer to the Federal Trade Commission or the Consumer Financial Protection Bureau. The publicly-traded company in Plano, Texas, has long lobbied to keep federal regulations at bay, spending more than $7.2 million lobbying Congress in the past decade, according to data collected by the Center for Responsive Politics. Some 47 states have laws on rental-purchase agreements that “are favorable to us,” Rent-A-Center told its investors in March. New Jersey, North Carolina, and Wisconsin have strict regulations over consumer transactions, including rental-purchase agreements. Ohio Attorney General Mike DeWine said the industry needs more regulation. The $3 billion company appeals to consumers who earn less than $50,000 a year and lack the credit score or savings account to buy products outright or charge on a credit card, according to its annual investor report. Many of its stores are located near low-income neighborhoods or military bases. Its stores’ showrooms offer new and used rent-to-own household goods that require customers to pay a weekly, bi-weekly or monthly fee. The company says its business model offers a hassle-free option to traditional purchasing that allows customers to return merchandise at any time, for any reason, as long as they aren’t behind in payments. To obtain ownership of the products, customers make payments for up to three years, paying as much as five times what they would pay at traditional retailers such as Best Buy or Ashley Furniture. But, on average, only 25 percent of rented items actually end up being purchased by customers, company and court records show. DeWine calls Rent-A-Center “a rip-off.” Ohio is home to more than 140 Rent-A-Center stores, the third highest in the nation. The company denied repeated requests for either on-camera, in-person or telephone interviews over a 5-week period with Raycom Media and NerdWallet. Rather, the company responded only to written questions. “Our mission is to improve our customers’ quality of life, providing access to durable goods for cash- and credit-constrained consumers and serving as a welcome hand up amid a sea of thumbs down,” wrote Gina Hethcock, senior manager of public and community relations for Rent-A-Center. Nearly 200 consumers have complained to Ohio Attorney General Mike DeWine about Rent-A-Center in the past five years. 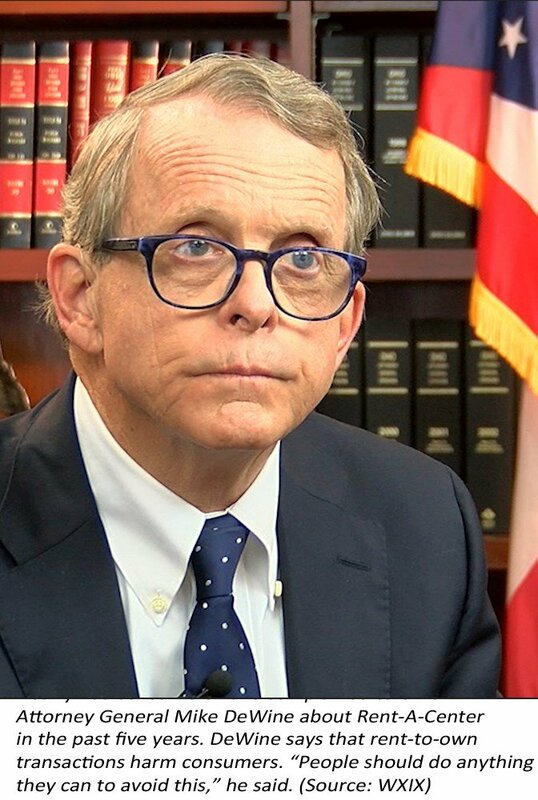 DeWine says that rent-to-own transactions harm consumers. “People should do anything they can to avoid this,” he said. Many customers complained that they didn’t understand the complicated rental agreements and the ultimate price they would pay. More than 90 percent complained about the company’s debt-collection tactics if he or she fell behind on payments. More than 150 people claimed they were being harassed over a debt they didn’t owe. Consumers also complained that the company maintained sloppy records. Nearly a third said they couldn’t get a copy of their payment history from Rent-A-Center or that the rental had been paid in full but showed as still due in company records or in credit reports. These government documents include nearly 700 complaints against Acceptance Now, Rent-A-Center’s kiosks located inside major furniture retailers. When consumers are turned down by the furniture stores for purchases on credit, they can sign up for rental agreements through the Acceptance Now kiosks in those stores. And scores of Acceptance Now customers have had problems, too, according to the news organizations’ investigation. When the bedroom set Corondolette Clay rented at a kiosk in Georgia became unaffordable, she returned the merchandise to Rent-A-Center and received a receipt showing that the furniture was in excellent condition and that her account was settled. Years later, she discovered the furniture turned up as an unpaid $3,300 debt on her credit report. Although she had all the paperwork to back up that she didn’t owe anything, it took more than a year – and intervention from the Texas attorney general’s office where Rent-A-Center’s corporate offices are housed – to clear the mistake. “It was an ordeal for me that I will never partake in again,” Clay said. If these complaints had been filed against a financial institution such as a bank or credit-card company, state and federal regulators could pursue action through an array of laws that govern loans and debt collection. But Rent-A-Center and other rent-to-own-companies operate outside those consumer protections. For many customers, Rent-A-Center seems like a retailer of last resort. Gonzalez walked into a Rent-A-Center in Miami, Florida in the spring of 2015, looking for a used bedroom set and a washing machine. She signed a rental-purchase agreement. Her plan was to pay off the items – about $500 for the washer and $1,250 for the bedroom furniture – within 90 days to avoid the more expensive long-term lease. But the single mother of two couldn’t cobble together the $1,000 or so that she had left to pay at the end of that 3-month period. At that point, her agreement turned into a long-term lease, with 64 more weeks of $70 payments. “I knew I was getting ripped off,” the 30-year-old legal secretary said. Only 11 states have laws that limit how much rent-to-own companies can charge to acquire ownership: California, Connecticut, Hawaii, Iowa, Maine, Michigan, New York, Ohio, Pennsylvania, Vermont and West Virginia. Those limits range from 2 to 2.4 times the cost of the product’s cash price, according to the industry’s trade group, the Association of Progressive Rental Organizations. But that cash price set by Rent-A-Center is largely unregulated. That’s the price a customer would pay to buy it within 90 days, and only six states – California, Hawaii, Maine, New York, Vermont and West Virginia – have laws that prevent companies from inflating the cash price far above the wholesale cost. Raycom Media and NerdWallet compared Rent-A-Center prices to retailers such as Amazon, Best Buy, Target, Wal-Mart and found that renting to own can cost a customer nearly six times more. For example, a VIZIO soundbar was for sale on Amazon for $148. To obtain ownership of that same product through Rent-A-Center, a customer would pay nearly $780 in several states including Alabama, Georgia, Louisiana, and Ohio. READ: See how Rent-A-Center prices compare to other retailers across the U.S.
Lisa Bellamy’s South Carolina home could be a Rent-A-Center showroom. Except for her bedroom set, she has rented to own every appliance and piece of furniture she has from Rent-A-Center. “The service is really good,” Bellamy said. She is a member of the company’s Inner Circle program, which rewards loyal customers with gift cards and rental discounts for giving Rent-A-Center feedback. The company provided her name to the news organizations as an example of a satisfied customer. Bellamy said she doesn’t mind that Rent-A-Center’s merchandise is “a little pricey” because she can get replacements when something breaks or when she tires of the furniture. Rent-A-Center markets its business model as a hassle-free way to have name-brand furniture and appliances. The company spokeswoman said that pricing is determined based on a number of factors including that customers can return the products at any time without penalty. “As a result of the ongoing, relationship nature of the rent-to-own business, Rent-A-Center and its competitors in the rent-to-own industry incur costs that retail companies do not,” the spokeswoman said. 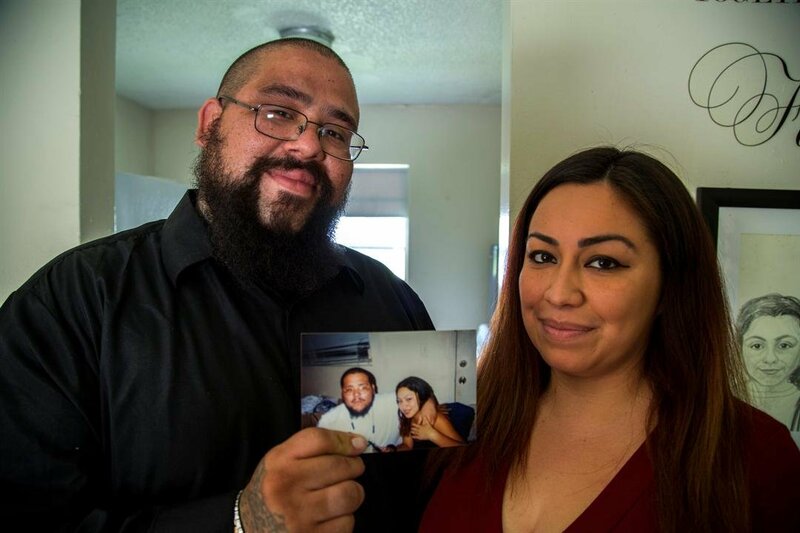 For a year, Gonzalez faithfully made on-time weekly payments. But then she got sick, diagnosed with an incurable disease attacking her thyroid. For months, she could muster the energy to work at her job only three hours a day. She began to fall behind on her rental payments. She tried to work out payments with the company because she couldn’t go without a bed or a washer. But as soon as she was one day late, her phone would start ringing. She didn’t consider returning the merchandise. By then, she had paid nearly $3,000 for them, nearly double the initial cash price set by Rent-A-Center. She tried to work with the company, but they often refused her money to bring her account current unless she paid weeks in advance as well. A neighbor once saw a Rent-A-Center employee rifling through Gonzalez’s mailbox and confronted him while videotaping the incident with her cellphone. On the video, the employee tells the neighbor that he is only putting papers in the mailbox. Gonzalez said she didn’t find anything in her mailbox from Rent-A-Center that day. And then, one Saturday morning, she was awakened by banging on her windows and doors. It was Rent-A-Center. Nine out of every 10 complaints filed with government watchdog agencies focused on Rent-A-Center’s debt-collection tactics. Andrea Gorman contacted the Ohio Attorney General’s office over Rent-A-Center’s debt-collection tactics in 2014. She fell behind on payments of a laptop after she lost her job. The company, she said, refused to work with her. Instead, an employee kicked in her door. She reported the vandalism to Lima police, according to law enforcement records. The harassment of a couple stationed at Camp Pendleton in California became so extreme that they filed a federal lawsuit. The couple said that Rent-A-Center employees called the serviceman’s superior officer at the base about the unpaid debt. Employees called their house 20 times a week demanding payment. They showed up on their doorstep. The debt-collection practices caused the wife to become so reclusive that she dropped out of college and needed her sister to move in to care for the children, the lawsuit said. Her husband was away on active duty at the time. The company reached a confidential settlement with the couple last year. Rent-A-Center has strict targets for keeping customers up to date on their payments. On Saturdays, each store’s percentage of past-due customers must be less than 6 percent, said former managers, who agreed to speak only if they were not identified because they signed nondisclosure agreements with the company. If stores didn’t hit those targets, employees were required to work extra shifts and managers were threatened with termination, the former managers said. The company says that it does not have to abide by the federal Fair Debt Collections Practices Act, which bans debt collectors from harassing or threatening consumers because it is not considered a debt collector. The company’s aggressive debt collection practices prompted the Washington State attorney general to file a civil lawsuit against Rent-A-Center in 2009. In its agreement to settle the case, the company vowed, among other things, to stop harassing customers for payments. Yet records show that consumers in Washington state still face problems with Rent-A-Center. One woman complained that employees scared her minor children. Another said that an employee disclosed personal information to her pastor. Others complained that employees used expletives, circled their houses on foot or used spoof numbers to disguise collection calls. Rent-A-Center told the attorney general’s staff that all such allegations were false. And company spokeswoman Hethcock wrote to the news organizations that such actions are “expressly prohibited” by company policy. Unlike a co-signer to a loan, a reference might not know that someone has used his or her name to vouch for the customer. Rent-A-Center requires the names of two relatives and two others. Gonzalez listed her longtime friend Joseph Arauz as a reference. He endured months of unwanted phone calls when she couldn’t make on-time payments. He didn’t know that Gonzalez named him on her rental application until he started receiving calls. Dozens of other consumers made similar complaints to state and federal agencies. Russell Hay, of Columbus, Ohio, had no idea that Rent-A-Center had been harassing his elderly parents until he answered their phone during a visit. Hay’s brother, who is estranged from the family, listed their parents as a reference for something he rented then failed to pay or return. They repeatedly told the employees that they didn’t know their son’s whereabouts. It didn’t matter. The calls kept coming. Hay’s father is almost 90 and suffers from dementia. His mom is in her 80s. Hay, too, couldn’t stop the calls so he contacted the Ohio attorney general’s office. The calls soon ended. Under existing laws, these contacts are “perfectly legal,” Ohio Attorney General DeWine said. Rent-A-Center’s policy says that employees may contact a reference only once, the spokeswoman wrote. Throughout the summer and fall of 2016, Gonzalez tried to make good on her rental agreement. She would pay to bring her account current when she had the money and could persuade employees to accept her payment. She was determined to make this work. By that August, Gonzalez had paid nearly $4,000 and employees then began threatening her with arrest. A neighbor saw a police officer at her door one morning. “I was scared,” she said, not only fearing jail but fearing an arrest would cost her her job. Laws in many states allow companies to pursue criminal charges against customers who renege on rental payments and don’t return rented items within a few days of a written request by the company. Prosecutors in Florida have filed criminal charges over the past decade against more than 3,000 people for failing to return rented merchandise, according to state records obtained by NerdWallet. A former prosecutor from Harris County in Texas said the rental industry lobbied lawmakers in his state 40 decades ago to allow it to pursue criminal charges against renters who didn’t return merchandise. Murray Newman, who worked in the Harris County prosecutor’s office from 1999 to 2008, said he could justify filing theft charges against consumers if they rented an item, never made a payment and refused to give it back to the company. But he said Rent-A-Center didn’t make such a distinction. It used the district attorney’s office as a collection agency, he said, going after customers who fell behind on payments with no intent to steal furniture. Melinda Sandlin was repeatedly threatened with arrest. When she got her furniture from a retail store, she didn’t realize she was signing a rental-purchase agreement with Rent-A-Center. After paying about $3,100 over a year, Sandlin thought for sure the furniture was paid off. She soon learned the truth: she still owed $8,000. She eventually hired an attorney and returned the furniture. Rent-A-Center allowed her to keep the $400 mattress because it had a small stain. Sandlin advises customers to proceed with caution and to read every word of the contract. Miami mother Gonzalez said the closer she inched toward ownership, the more aggressive the collection tactics became when she fell behind on payments. She suspected Rent-A-Center wanted the merchandise back so it could be re-rented. By then, she had paid more than double the products’ initial price tag. The company told its investors that, on average, merchandise is rented by three different customers before a fourth acquires ownership. Last fall, Gonzalez decided she needed help and began contacting lawyers. “I just wanted it to stop and I didn’t know how,” she said. After two failed attempts, Gonzalez found lawyers Darren Newhart and Court Keeley, who took on her case for free. Gonzalez’s attorneys wrote to Rent-A-Center with instructions to stop contacting her. Soon after, Rent-A-Center cut off her access to her account, making it impossible to continue paying the $1,000 she still owes to own the furniture. The attorneys filed a lawsuit against the company in November. “I feel guilty for my children having to go through this,” she said. Gonzalez said she has learned from what’s become a devastating mistake. She now shops on the second-hand market and on apps such as OfferUp, where she bought a washing machine to replace the one she rented, which has long since quit working. She still owes Rent-A-Center $57.66 for it. Reporters Brad Wolverton and Alex Richards, of NerdWallet; The Texas Tribune; and the Sarasota Herald-Tribune contributed to this report. Copyright 2017 NerdWallet and Raycom Media. All rights reserved.